Please send me any corrections or additions. I did the best that I could. More pictures later. My neck hurts. I doubt it was coincidence that I lived across the street from the club. My father and Dr. Vitanza were business partners with GM Reuben Fine. I think that's what got Dr. Vitanza involved in chess, and he very likely saw the building for sale (they would buy 10 West 10th Street) while visiting the club. I still have some pieces from the wooden set Dr. Vitanza gave me many decades ago. 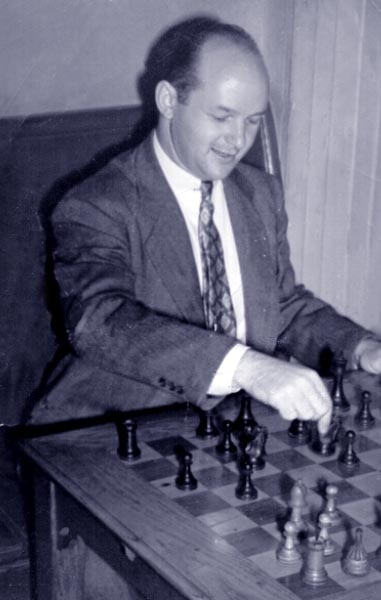 Dr. Vitanza helped increase my interest in chess, though I was taught by my mother, and I was also inspired by my great-uncle, Ben Ferstadt, who was from the town of Berestechko in the Ukraine. I played chess in junior high school. Our faculty adviser was Mr. Vinocore. In our junior high school club was future US Women's Champion Rachel Crotto. I didn't show up for the first scholastic tournament I was registered for. 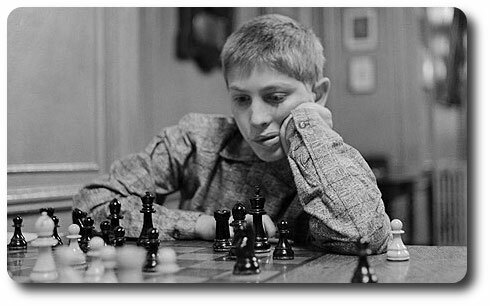 My first actual rated chess tournament was the last rated chess tournament ever to be held at Chess House on 72nd Street. While Chess House was owned by NM Charles Hidalgo, the tournament was run by Louis Brockman, who later ran tournaments with his father Henry in Flushing. 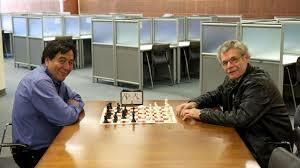 I first met FM Asa Hoffmann at Chess House. My first visit to the Marshall was when I was a young teenager and me and my friend Howard (not Howard Prince. A different Howard) got lost on the way back from my second tournament in Elizabeth New Jersey, where I first met Goichberg and Joe Lux. I think we had run out of money and asked both of them to lend us enough money to get home, and neither of them did. Probably Joe didn't have too much back then. We were all teenagers. Me and Howard had just enough money to take the PATH back to Manhattan. I lived uptown in those days with my mother. After trying to find my father and visiting the Marshall, we started walking uptown, and a cop let us into the subway at 23rd Street. When we went into the Marshall, only Bill Slater was there, or maybe one or two other people. I first played my friend Howard and he beat me. Then Bill Slater played my friend, but refused to play me because I was supposedly too weak. Some day someone will write about some of our most minor deeds. I got elected to the board I think in my early twenties after I already had had my own chess tournament business. I am still the Governor who got elected at the all-time youngest age. Goldwater was president (http://www.autodidactproject.org/other/goldwat1.html). I didn't know the club was broke until many years later. I think the other governors knew but they didn't tell me. As far as I know, I was the second governor in the club's history to be nominated by petition, the first being Alex Sheldon. Peter Sepulveda, who was like an annoying big brother to me, encouraged me and signed my petition. I heard from him recently, but he rarely comes to the club unfortunately. Dr. Milton Hanauer also encouraged me a great deal. 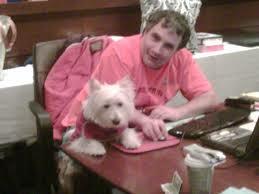 Then World Champion, GM Robert J. Fischer made his last public appearance in New York at the Marshall Chess Club. He was seated on the bench nearest to the front East window. With him was Betty Buscemi, who was night manager before IM Jay Bonin. I was night manager after IM Bonin. I left the board and my job there during the aftermath of throwing Goichberg's tournaments out of the club. It was during the time of the Goichberg tournaments that most of the club's valuable trophies were stolen. There was no security in place, not even locks. Goldwater was an anarchist and didn't believe in locks. The only locks were on the front door of the building and the office. The club's antique chess sets on display in the back room were sold off. NM Leslie Braun helped Mr. Goldwater pack them up and take them to Southerbees. Someone broke into the office with a pickaxe. I found the pickaxe in the basement. Someone was planning to break into the office over and over again. Dr. Vitanza broke the pickaxe handle into small pieces with a larger pickaxe, and left the pieces in front of the club in the hopes it would leave a message to the thief that his efforts were unwelcome. One of the other members, Bob Lukasik, repaired the door and reinforced it with a thick wooden board which remains there to this day. Someone stole the bust of Frank Marshall as a joke but later returned it. The last years of the Goldwater administration were awful. Some of the elderly members had left when Goichberg's tournaments came in. Even though Goichberg's tournaments were only on the weekends, these elderly members liked to play every day. The club was still active though, due to the high concentration of tournament players. When Goichberg was thrown out, there was no equivalent tournament program put in place at the Marshall. 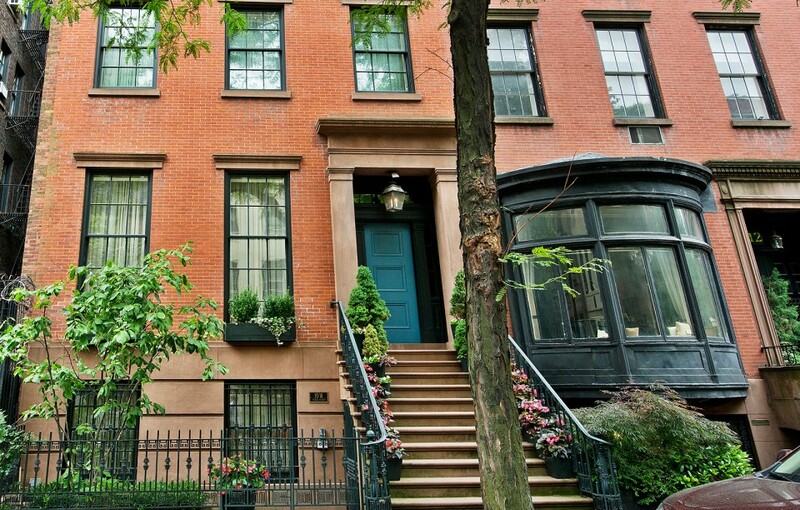 Almost all of the tournament players went to Goichberg's new place on 14th Street, the Bar Point. 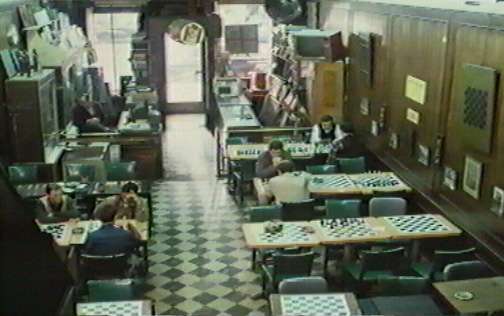 The Bar Point, I believe, eventually became the Chess Center of New York, under the ownership of Steve Immitt. Mr. Goldwater was sick with leukemia. Unfortunately most of the board members were afraid to come forward to take up the leadership of the club for fear of Mr. Goldwater, who everyone assumed would leave the club a great deal of money. Goldwater left the club no money at all, and I don't blame him. There was no one around to protect it and put it to good use. Dr. Finkelstein became president pro-temp and then president. I don't know how that happened, but usually one president appoints the next president, just a new board members usually come on the board on the suggestion of other board members. Dr. Finkelstein and Dr. Hanauer were once co-principals and best friends, but it seemed to me that they were two very different men. Dr. Hanauer was one of the first pioneers of scholastic chess long before everyone was doing it. I don't know much about Dr. Finkelstein's administrations. I wasn't there. I heard later that there was an untoward attempt to sell the building which was headed off at the last minute. Those who go far enough to the Haft administration know that there were three plaques that sat together on the mantle of the middle fireplace. 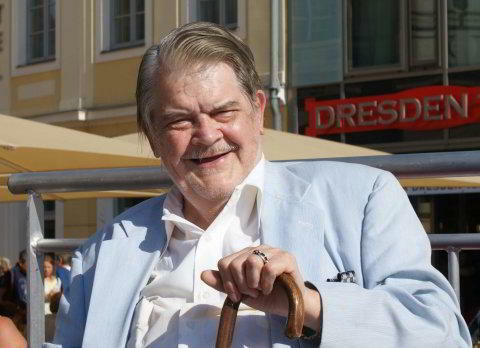 One was Dr. Finkelstein, one was Alex Weber. I forget who the third was. I heard that Alex Weber was one of the great men who stopped the sale of the building. If it were not for him we would not have a club today. 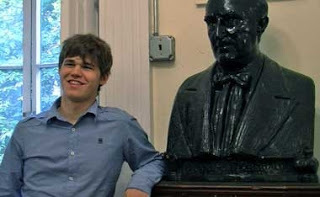 There would be no club for GM Magnus Carlsen to visit, for us to play in tournaments, or any of the good things that are happening these days. 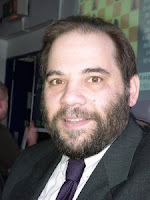 Another person who was instrumental in saving the club was Peter Sepulveda. Peter was never president, but he brought many new people on to the board over a period of several decades. He had a great deal of influence other who the presidents would be. I believe he played a major role, not only in selecting Gary Sperling, but also in replacing him with Marianna Bellizzi. From what I've heard, Sperling reactivated the system of committees which traditionally ran the club, but he was too autocratic, and was replaced by Marianna Bellizzi, who was president for many years. When she got tired of being president, Peter helped bring in Leon Haft. I had been at the Manhattan and rejoined the Marshall when Leon Haft hired my friend FM Ron Young as manager. Leon wasn't crazy about me. In fact Leon threw me out of the office a couple of times. While he never apologized for throwing me out of the office, many years later he found a letter I had written him, and when he saw me at the club he complemented me on it. 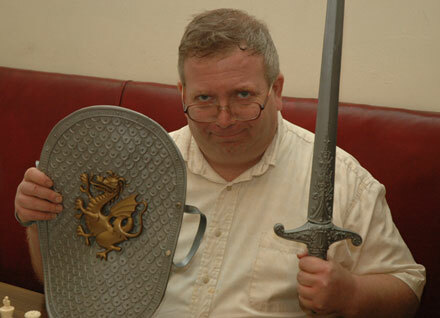 During the Haft years, Steve Immitt was invited in to increase the chess activity in the club. All I can remember was that the club was very active and fun during those years. Later I would find out that Leon had taken out a balloon mortgage on the building and had used it to operate the club. When the mortgage came due during the Prince years we were mad at Haft for having done that, but now I think he did the right thing in that. I actually liked the club's decor, or the lack thereof. It was just something I had grown up with. Note: I should add that few give Leon credit for using part of the mortgage to combine two of the upstairs apartment, thus ending rent stabilization in the building. Haft was controversial for a number of reasons. During the Haft administration, the club failed to make its annual tax filings. 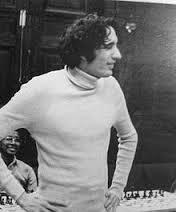 The tax filings had been entrusted to Isadore Rothman, who was very sick with the cancer that eventually killed him. Rothman was given full blame. Jack Henry eventually talked the IRS into lowering or eliminating the fines. Leon left before his term was up, and with no active officers, Ron Young had to handle the club's business pretty much on his own. Steve helped out from time to time. Ed Kopieki was the night manager. Despite all of these problems, which most of the members didn't know about, the club was very active during Haft's time. There were internationals run Dr. Eric Schiller and Eric Moskow, MD. There was also a series of internationals that included Josh Waitzkin and some of his contemporaries, including GM Maurice Ashley. Bob Dunnigan was a very active volunteer through most of the Haft administration. 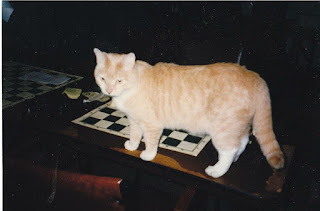 We had a big orange cat in those days named Marshall Gambit. 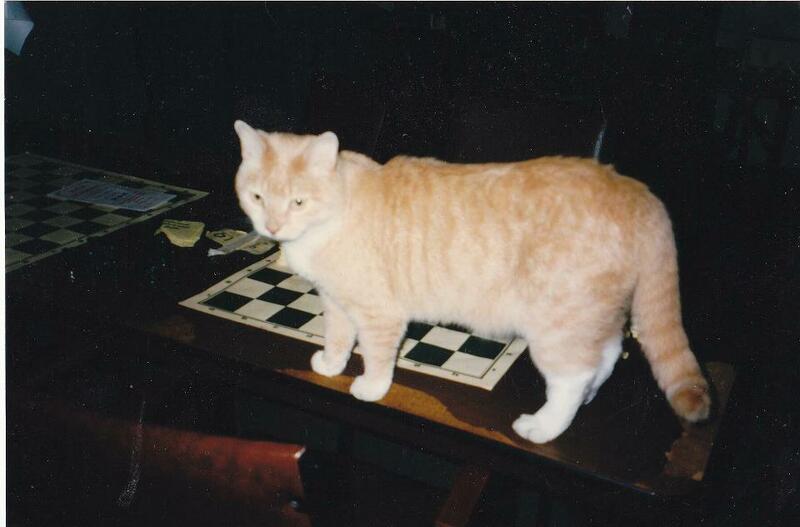 He was a perfect cat for the chess club. He didn't like dogs or other non-members. When we had internationals, he didn't like to be excluded from the room, he wanted to watch his friend FM Ron Young play. We would fight him over this, but he usually got in anyhow. To my knowledge he only walked across a game in progress one time. It was during an international, and he knocked over one of Ron's rooks. 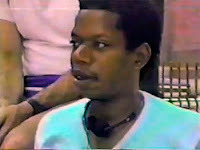 I think Ron asked his opponent if he had to say "j'adoube" before placing the rook back on the board. Sadly the cat left the planet the same week as NM Leslie Braun. It wasn't until later when Howard Prince was president that GM Bill Lombardy encouraged me to run for the board again. Actually the year before Howard agreed to make me assistant treasurer. During that year, I not only learned how little money the club had, but also that membership was plummeting due to an ill-timed dues increase. The building actually wasn't doing that badly at the time even though some of the apartments were rent stabilized. In fact, we were putting money in the bank. 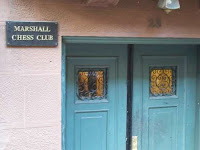 The club had a very low budget due to the decline in membership, but I still remember those as good years. After I became assistant treasurer and then treasurer, I saw that the club didn't and shouldn't get too much cash from tournaments. The best source of revenue is Resident memberships. I think the club had a tradition of not encouraging professional players, because the original idea was that GM Marshall would be the only chess professional there. Unfortunately the idea of not encouraging professional chessplayers went on for decades even after Marshall died. For many years in a row, the strong GM Andy Soltis won the club championship. Until he was outscored one year by then NM Brian Hulse. The idea of not encouraging professional players still lives on in the policy of not allowing titled players to vote. The times when NM Doug Bellizzi was manager were great. 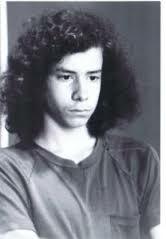 One of the great attractions was Israel Zilber (http://en.wikipedia.org/wiki/Israel_Zilber), a strong player who had beaten Tal twice. In Tal's game collection book, the Game #1 is a game Tal had played with Zilber when Tal was 12 and Zilber was 15. Mr. Zilber suffered from schizophrenia. He always wore a elaborate sea captain's uniform. He stored a large number of these uniforms on the coat racks we then had at the club. People would come from everywhere to play him. Everyone from the legendary NM Peter Winston (http://observer.com/2012/07/the-mysterious-disappearance-of-peter-winston/) to Vincent Livermore came. It was during this period that NM Winston played in his last rapids before his disappearance. Zilber was sleeping at the club. This was forbidden by the administration (which I was not part of at the time) and they kept on taking away his key to the front door. I kept making copies of the key and giving them to him. That's just how I am.